According to an unnamed MetroPCS employee, the pre-paid carrier is going to be offering customers the new Microsoft Lumia 640. While AT&T is expected to offer the handset next month, the tipster says that the entry-level phone won't be available from MetroPCS until mid-to-late-May. Although pricing is not completely settled, it would appear that the T-Mobile subsidiary will tag the Lumia 640 at $99. Not surpisingly, T-Mobile is also expected to add the model to its lineup. The Microsoft Lumia 640 and the larger-screened Microsoft Lumia 640 XL were both introduced earlier this month in Barcelona during MWC. The Lumia 640 features a 5-inch screen (protected by Gorilla Glass 3) with resolution of 720 x 1280. That works out to a 294ppi pixel density. A quad-core 1.2GHz Snapdragon 400 CPU is under the hood and the handset carries 1GB of RAM. Native storage amounts to 8GB and those who require additional memory will be able to employ the 128GB microSD slot that is included. The rear-facing camera weighs in at 8MP and there is a front-facing .9MP shooter for selfies and video chats. The device is powered by a 2500mAh battery, which is a pretty large capacity for a low-end handset. The unit comes pre-installed with Windows Phone 8.1 and should be updated to Windows 10 later this year. 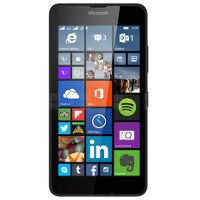 If you're interested, the Lumia 640 XL offers a larger 5.7-inch screen (carrying a lower pixel density of 259ppi), 13MP rear-facing and 5MP front-facing cameras and a larger 3000mAh battery. We don't have any hint on what AT&T will be charging for this model, or for its version of the Lumia 640. If you own one windows phone......you own them all. i love u own me lol! If you own one Android, you've owned them all. If you've owned one iPhone, you've owned them all... not really sure where that comment was going. Ran my Lumia 925 with MANY different configurations, tweaks, and each had its own feel. Also... now that I'm on my Lumia 1520... :D I just can't get over the new phone feel! Also... that Lumia 640 XL is looking really good. Will probably get some newer Lumia's for my family. Too bad Lumia 640 XL is not coming to T-Mobile.